At at average age of 5, children start to lose their baby teeth in order to make room for their new, larger adult teeth. Many families choose to have the Tooth Fairy come and swap those adorable baby teeth out for a special monetary gift. 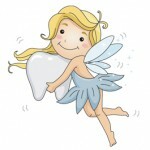 We have heard many different ways to make the tooth fairy a little more fun and exciting. Here are some things we would like to pass along!